Tourists that hop off the plane in Florida have romantic visions of the Sunshine State being forever warm and tropical. 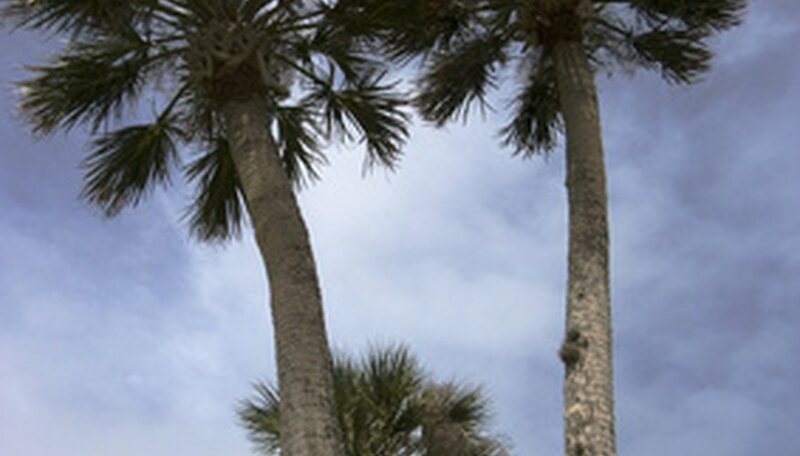 While that condition exists most of the time, the types of palms seen across Florida vary because of the differences and extent of winter cold. The Panhandle gets the coldest in winter, and thus supports the fewest palm species, while extreme southern Florida's tip enjoys warmer winters and a tremendous palette of palms that survive the milder winters. Florida's Panhandle is in USDA Hardiness Zone 8, where winter temperatures often dip down to 15 to 20 degrees Fahrenheit. This limiting factor finds cities like Pensacola, Tallahassee and Gainesville displaying cabbage palms (Sabal palmetto), European fan palms (Chamaerops humilis), Canary Island date palms (Phoenix canariensis), windmill palms (Trachycarpus fortunei) and pindo palms (Butia capitata), as well as a few California fan palms (Washingtonia robusta). Further down the peninsula, in central Florida, winters are milder than in the Panhandle. In cities like Daytona Beach, Orlando, Melbourne, Sarasota and Tampa, winter lows don't drop much below 25 to 35 degrees, if that. Located in Zone 9, more palm species grow well. While the windmill palm isn't a popular choice in central Florida, all the palms listed for northern Florida also grow here, especially the California fan palm. A visit to this area also introduces you to the queen palm (Syagrus romanoffiana), Chinese fan palm (Livistona chinensis), pygmy date (Phoenix roebelenii), paurotis palm (Acoelorraphe wrightii) and slender lady palm (Rhapis humilis). More sheltered locations, protected from cold northwesterly winter winds, afford inclusion of a Bismarck palm (Bismarckia nobilis), royal palm (Roystonea regia) and perhaps an adonidia palm (Adonidia merrillii), also known as the Christmas palm. South Florida, which enjoys winter lows rarely dropping below 35 degrees, is in USDA Zones 10 and 11; coastal locations remain milder in winter than inland counties. The greatest diversity of palms occurs in cities like West Palm Beach, Fort Myers, Naples, Miami, Key West and Fort Lauderdale. Impressively lined streets reveal armies of coconut palms (Cocos nucifera) and royal palms as well as more tropical-native palm species like triangle palms (Dypsis decaryi), blue latan palms (Latania loddigesii) and Bailey fan palms (Copernicia baileyana). Also present are screening rows of areca palms (Dypsis lutescens). Other common species include pygmy date, Christmas palm, Macarthur palm (Ptychosperma macarthurii), bottle palm (Hyophorbe lagenicaulis), fishtail palm (Caryota spp. ), buccaneer palm (Pseudophoenix sargentii) and joannis palm (Veitchia joannis). Scores of other species occur in both public spaces and private gardens.